This course has truly transformed the lives & enhanced the careers of thousands of people around the world. Learn this holistic design system based on care of the Earth and its inhabitants, and efficient use of natural resources. Even in the most difficult conditions, permaculture empowers people to turn wastelands into food forests. The 72 hour PDC curriculum is a training program for farmers, homeowners, renters, accountants, landscapers, architects, builders, developers, civic planners, educators, environmentalists, students...anyone interested in meeting human needs by turning our communities into fully functioning ecosystems. Receive hands on experience on how to apply the principles of ecological design in your own home, neighborhood, state, nation and beyond. Successful graduates will receive a Certificate in Permaculture Design. Take advantage of this terrific opportunity! Hunter Heaivilin holds a degree in Tropical Forest Ecosystem and Agroforestry Management and has worked in projects throughout Hawai`i, Haiti and Peru & has taught on PDCs in Haiti and Molokai. He is lead designer at his consultancy firm, Pono Permaculture and teaches at The Green House, an urban model for sustainable living in Honolulu. 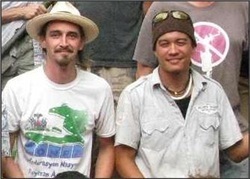 Matthew Lynch is the founder of the nonprofit Asia-Pacific Center for Regenerative Design and has worked on projects & taught on PDCs throughout Mongolia, Australia, and now Hawai`i. His work focuses on applying permaculture design principles towards building community resilience and moving beyond sustainability. 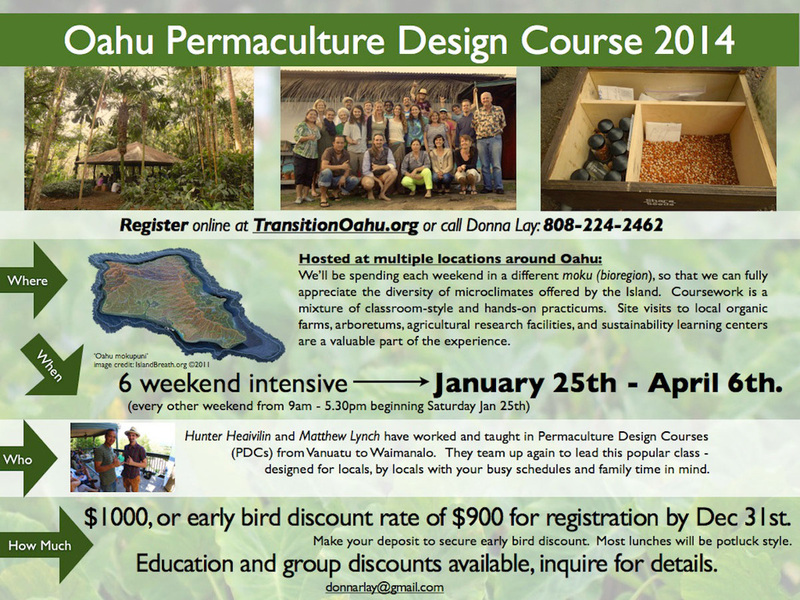 The Permaculture Design Certification course was a thrilling adventure for me. Prior to taking the course I had a feeling that there was a better, more self-sufficient way to live with less negative impact on the environment. The course replaced that “feeling” with a practical understanding and approach to creating this better life. Learning about the functions and needs of individual plants, animals and micro-organisms opened my eyes to how the natural world takes care of itself and the potential to leverage natural systems to create more abundance and resiliency for my family. While I now understand how to design an efficient (minimal work and very little waste) food forest, what surprised me about the course was that it gave me a new lens of understanding and appreciation for the people that I interact with. I was amazed how the design principles can be applied to personal relationships. I have come to appreciate that the even more important than being self-sufficient is building a more self-reliant community with others so that we can all thrive together. $300 non-refundable deposit required to hold your space. Balance due by first day of class. Register via check or Paypal. Please also fill out registration form on left. Use the Buy Now button to make a payment. Any questions, please contact Donna at donnarlay@gmail.com or call 808-224-2462.